Every month, Forest2Market publishes updated forecasting products designed specifically for participants in the forest value chain. The Economic Outlook is a macroeconomic indicator forecast that supplies critical information, context and insight about general economic trends and direction, and the 4Cast supports regional operational decision making for those who buy and sell timber. With an understanding of economic indicators, future stumpage prices and insight into buying and selling windows (periods in which buyers or sellers hold relative market advantage), subscribers are better able to time sales or purchases, negotiate prices, manage workloads and control inventory levels. The following commentary is just a sampling from the most recent Economic Outlook for March, 2019. The monthly average US dollar (USD) price of West Texas Intermediate (WTI) crude oil gained for a second month when rising by $3.58 (+7.0%), to $54.95 per barrel in February. The price rise was generally attributed to reduced OPEC output; cartel production fell to a four-year low in February, as Saudi Arabia and its Gulf allies over-delivered on the group’s supply-cut agreement while Venezuelan output continued to decline, and some Libyan fields remained offline. “Most analysts are predicting oil prices will continue to rise, as the case for lower production later this year seems stronger than the case for lower demand,” wrote the editors of Peak Oil Review. Their expectation hinges on speculation—based on an observed falloff in fracking activity—that the meteoric rise in US shale production is nearing an end. Wall Street has become increasingly restive over the lack of returns on investment in the (especially shale) oil sector, and is gradually imposing more restrictive capital constraints that could ultimately slow supply growth. “The structural challenges the industry faces aren’t going to go away, so energy companies... need to clearly articulate how they will allocate investors’ capital and prioritize shareholder returns in a manner that rebuilds confidence,” said Nick Stansbury of Legal & General Investment Management. If shale output stagnates, prices would undoubtedly rise barring a corresponding infusion from OPEC+. At present, however, “there is no evidence that a spectacular jump in global oil production is in the offing,” POR’s editors added, “and new oil discoveries remain well below the world’s annual oil consumption of some 36 billion barrels per year.” Hence, global recession remains the biggest downside risk to prices at the moment. 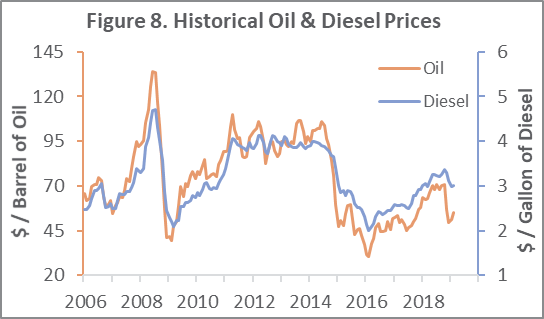 Prices will trend higher through July 2019 on lower production before slack demand creates a slide in early 2020. 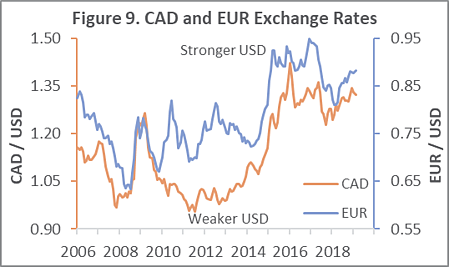 In February the USD’s monthly average value depreciated versus the Canadian dollar (CAD: -0.7%) but appreciated against the euro (EUR: +0.6%). The average CAD/USD rate was C$1.321; EUR/USD: €0.881 (Figure 9). On a trade-weighted index basis, the USD gained fractionally (+0.1%) against a basket of 26 currencies. Some analysts attributed the CAD’s strength to oil’s 2019 uptick. That makes sense since the CAD/USD rate is strongly and negatively correlated with WTI’s price (i.e., as WTI rises—all else held constant—it takes fewer CAD to buy a USD). Comparatively robust Canadian hiring and wage growth likely also contributed to CAD strength. The EUR, on the other hand, continues to be plagued by anemic economic performance. Germany is experiencing a protracted slump in manufacturing; also, household spending has ground to a halt in France. “If France stops consuming and Germany stops producing you have a major problem in the Eurozone,” said Allianz’s Ludovic Subran. Those two countries together account for about half the euro-area economy. Looking forward, “recent data suggest that the slowdown in the global economy has been more pronounced and widespread” than expected, the Bank of Canada (BOC) said. The Bank left its overnight interest rate unchanged at 1.75% and said uncertainty over the timing of future rate hikes had increased. The BOC’s bleak view carries the potential of at least partially offsetting the influence on the CAD from rising oil prices; also, the CAD has typically weakened during periods of tepid US growth and/or recessions. The Eurozone’s outlook is similarly dour. The European Central Bank has cut its growth and inflation forecasts, postponed the timing of its rate hike to 2020, and launched a new round of cheap loans to banks.